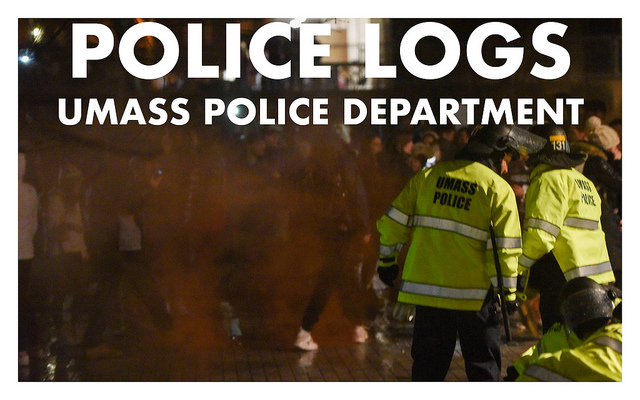 The following police logs are from the University of Massachusetts Police Department from Friday, March 29, 2019 to Sunday, March 31, 2019. 3:58 p.m.: The operator of a vehicle was issued a verbal warning for a safety violation on University Drive. 4:06 p.m.: A reporting party stated she received a phone call to her work-issued cell in which she spoke with a child while an adult was yelling in the background. A Belchertown address for the number was obtained through AT&T, and the Belchertown Police Department was notified. 5:33 p.m.: A reporting party at John Quincy Adams dorm on Fearing Street stated they were concerned about a friend who appeared upset last night and they have not heard from them since. The service desk advised to have the residence director do a door knock and call back with concerns. 4:52 p.m.: Hadley Police Department advised of a vehicle operating erratically all over the road and nearly hit several oncoming vehicles. The Amherst Police Department later advised the vehicle was on UMass campus and ran the traffic light at Commonwealth Avenue. The vehicle was stopped at the rotary, entering Lot 61 on Governors Drive. The operator did not show signs of impairment or medical issues and did not think he ran the red light. He was let go with a verbal warning. 6:41 p.m.: The operator of a vehicle was issued a verbal warning for a safety violation in Lot 30A on Campus Center Service Road. 8:34 p.m.: The operator of a vehicle was issued a verbal warning for a plate light violation on Massachusetts Avenue. 8:47 p.m.: The operator of a vehicle was issued a verbal warning for a one-way violation on N. Residential Drive. The operator had an Austrian driver’s license in hand. 8:52 p.m.: The operator of a vehicle was issued a verbal warning for a headlight violation on N. Pleasant Street. 9:01 p.m.: APD advised of a traffic offense on Eastman Lane. The operator of the vehicle was stopped on N. Pleasant Street by Lederle Graduate Research Center and issued a verbal warning for a headlight violation. 10:10 p.m.: The operator of a vehicle was issued a verbal warning for a failure to stop on lower Massachusetts Avenue. 11:58 p.m.: The operator of a vehicle was issued a verbal warning for an improper lane change at Governors Drive at the Cold Storage. 5:03 p.m.: A reporting party stated that an assistant residence director called her about a student not complying with not bringing alcohol into a first-year dorm. The student was only claiming to be 19 years old. A small amount of alcohol was seized at 5:27 p.m.
9:04 p.m.: Alcohol was seized for destruction in Lot 32 West (south of Massachusetts Avenue). 9:24 p.m.: Two male parties were observed in Lot 32 West (south of Massachusetts Avenue) in front of a vehicle with Bud Light cans in the front and a duffel bag containing a 30 rack of Bud Light. Both parties were observed to be under the age of 21. One party was arrested, and the other was issued a summons. 11:24 p.m.: A party was found with alcohol at Kennedy Dorm on Massachusetts Avenue. A small amount of alcohol was destroyed on scene and the party did not meet protective custody criteria. 6:06 p.m.: A residence director at John Quincy Adams dorm on Fearing Street requested an officer to assist with a well-being check. No contact was made with the involved party. A residence director contacted the original reporting party, and no new information was gathered. 6:48 p.m.: A reporting party stated there are not residential life spots available in Lot 50B on James Road. An Ernie’s tow truck was requested. The tow truck removed one vehicle. 12:05 a.m.: The operator of a vehicle was issued a verbal warning for failing to stop and a safety violation on Fearing Street. 12:55 a.m.: The operator of a vehicle was issued a verbal warning for a failure to stop at the Studio Arts Building on Thatcher Road. 1:38 a.m.: The operator of a vehicle was issued a verbal warning for a safety violation in lot 41 (north of the Physical Plant) on University Drive. 1:42 a.m.: The operator of a vehicle was issued a verbal warning for operating on a sidewalk in Lot 71 (west of Whitmore) on Massachusetts Avenue. 2:37 a.m.: The operator of a vehicle was issued a verbal warning for operating with no headlights on University Drive. 2:47 a.m.: The operator of a vehicle was issued a verbal warning for driving the wrong way on a one-way on Sylvan Drive. 3:34 a.m.: The operator of a vehicle was issued a verbal warning for a safety violation on Fearing Street. 8:05 a.m.: The operator of a vehicle was issued a verbal warning for failing to stop for sign/light on the intersection of University Drive and Southwest Circle. 8:17 a.m.: The operator of a vehicle was issued a verbal warning for driving too close Massachusetts Avenue by West Gate. 9:54 a.m.: The operator of a vehicle was issued a verbal warning for a failure to stop on the intersection of Massachusetts Avenue and University Drive. 10:21 a.m.: The operator of a vehicle was issued a verbal warning for a defective brake light on Hicks Way. 10:50 a.m.: The operator of a vehicle was issued a verbal warning for a failure to stop on Commonwealth Avenue. 2:01 p.m.: A vehicle was issued a verbal warning for an outdated inspection sticker on Governors Drive. 4:58 p.m.: A verbal warning was issued to an operator of a vehicle on Massachusetts Avenue for a one-way violation. 8:31 p.m.: The operator of a vehicle was issued a verbal warning for operating without headlights on University Drive. 8:41 p.m.: A verbal warning for operating without headlights was issued to the operator of a vehicle on Governors Drive. 9:55 p.m.: The operator of a vehicle was issued a verbal warning for operating without headlights on Massachusetts and Commonwealth avenues. 11:28 p.m.: A traffic stop on Massachusetts Avenue led to the operator of a vehicle receiving a verbal warning for a plate light and not stopping at a red light. 11:49 p.m.: The operator of a vehicle on lower Massachusetts Avenue was issued a verbal warning for operating without headlights. 12:09 a.m.: Parties were advised to not play in the steam on by the Lincoln Apartments on Lincoln Avenue. 8:59 a.m.: A party was found sleeping in the lobby of the Isenberg School of Management and the door was found propped open. The party had come from the shelter across the street and found the door propped open. The party then left the building. 9:29 p.m.: An individual was spotted out in the load dock of Franklin Dining Commons on Stockbridge Road. The party checks okay. 11:20 p.m.: An involved party was seen standing on the double yellow line in the Sylvan Courtyard on Eastman Lane. The party check okay. 12:57 a.m.: An intoxicated party was found on Lincoln Avenue. The party did not meet protective custody criteria. 2:12 a.m.: A possible alcohol stop was called in by a cadet and APD was notified. 1:07 a.m.: A small amount of alcohol was dumped on scene at Lincoln Avenue. 1:38 a.m.: A small amount of alcohol was destroyed on scene in Lot 32 West (south of Massachusetts Avenue. 5:28 p.m.: A verbal warning was issued to an involved party in Lot 32 West (south of Massachusetts Avenue) and a small amount of alcohol was seized. 7:37 p.m.: An individual was summoned for arrest in Lot 22B (west of University Drive). 5:04 p.m.: A traffic warning was issued to an operator of a vehicle on University Drive. A verbal warning was then issued for inspection. 6:39 p.m.: A traffic citation was issued to the operator of a vehicle on University Drive. 1:03 p.m.: A vehicle parked in Lot 42 (south of Boyden Gym) was towed and impounded by Ernie’s. 1:55 p.m.: A vehicle blocking the roadway on Lot 42 (south of Boyden Gym) was towed. The owner paid the drop fee. 8:25 p.m.: An officer requested a vehicle be towed in Lot 50G (near Washington Tower) for being parked in a handicapped spot. The vehicle’s owner was called and moved the car. 4:02 a.m.: A wallet was found in John Quincy Adams Dorm on Fearing Street. 11:51 a.m.: A chemical spill occurred in room 455 of the Integrated Sciences Building on N. Pleasant Street. No police services were needed and the neutralized spill was cleaned up. 2:21 p.m.: A 911 call was made, and the party on other end disconnected the phone. The call was traced to a room in the Campus Center. The door to the room was secured, and someone with a key was contacted. The room was the telecom room and parties on scene advised that it may be an error with a credit card reader. 2:37 p.m.: A pre-alarm at the Melville Dorm on Massachusetts Avenue was set off due to cooking in the room. 4:17 p.m.: A motorist was lost on lower Massachusetts Avenue and directions were provided. 4:21 p.m.: An accidental/defective alarm went off in Chenoweth Laboratory on Holdsworth Way. 4:33 p.m.: An accidental/defective alarm went off at Maple House at the Commonwealth Honors College on Commonwealth Avenue. The Amherst Fire Department was on scene, and the alarm was reset. 12:21 a.m.: A small amount of alcohol was destroyed on scene after an officer investigated a suspicious party on N. Pleasant Street and Massachusetts Avenue. 12:26 a.m.: An altercation between two parties in Lot 32 W (south of Massachusetts Avenue) was investigated by an officer. One party was sent on his way and told to call UMPD. 1:50 a.m.: An officer states he went to Lincoln Avenue and spoke to the parents. 3:19 a.m.: A party near Lot 32 on Lincoln Avenue was able to reconnect with his friend on campus. 12:47 a.m.: A small amount of alcohol was poured out by two parties near a bus stop on Massachusetts Avenue. 1:06 a.m.: An operator of a vehicle on University Drive and Fearing Street was issued a verbal warning for failing to stop at a stop sign. 1:26 a.m.: An operator of a vehicle was stopped an issued a verbal warning for failing to stop at a stop sign near a bus stop on Massachusetts Avenue. 1:41 a.m.: A verbal warning was issued to an operator of a vehicle on Massachusetts Avenue for operating without headlights and not having their driver’s license on hand. 1:57 a.m.: The operator of a vehicle on Massachusetts Avenue near the Robsham Visitors Center was issued a verbal warning for operating without headlights. 2:33 a.m.: A verbal warning was issued to an operator of a vehicle on Eastman Lane and N. Thatcher Way for operating without headlights and not having their driver’s license on hand. 2:47 a.m.: A verbal warning for failing to stop at a stop sign was issued to the operator of a vehicle on Commonwealth Avenue. 11:36 a.m.: The operator of a vehicle on University Drive was issued a verbal warning for defective equipment. 1:17 a.m.: An officer investigated a vehicle parked outside of the Robsham Visitors Center on Massachusetts Avenue that was taking up four parking spaces. 1:31 a.m.: An individual in John Quincy Adams Dorm on Fearing Street was placed in protective custody. 1:58 a.m.: An individual in Kennedy Dorm on Massachusetts Avenue was placed in protective custody. 2:46 a.m.: An individual in Washington Dorm on Fearing Street was placed in protective custody. 2:21 a.m.: A cadet states a male in a red hoodie and female were arguing near Haigis Mall and he was chasing her. The male party was running toward N. Pleasant Street. The female said there was no physical contact and was given a rights and resource card. She did not want an order of protection and the parties were sent on their way. 7:17 a.m.: A party in front of the Polymer Research Center on Governors Drive was looking for an event. 1:25 p.m.: A reporting party requested to file a report for a stolen cell phone. The party was later able to locate their phone. 10:37 a.m.: A reporting party stated vehicles were double parked in Lot 42 (south of Boyden Gym) on Commonwealth Avenue and was concerned that an ambulance wouldn’t be able to get in, if needed. Two vehicles had no association to campus and the owners couldn’t be contacted by the reporting party to be notified of the tow. One vehicle was towed by Ernie’s and the other vehicles were moved before Ernie’s could get them on the hook. 2:07 p.m.: In Lot 42 (south of Boyden Gym) on Commonwealth Avenue, cars were double parked and Ernie’s Towing was called. Several of the vehicles were not associated with campus and six of the seven cars were towed and impounded. 1:17 p.m.: A pre-fire alarm was activated in McNamara Dorm in Sylvan Residential Area on Eastman Lane. The reason for smoke detector activation is unknown. 7:03 p.m.: A wastebasket fire in Thoreau Dorm on Massachusetts Avenue caused the fire alarms to activate. 10:58 p.m.: Authorities were notified when an accidental/defective alarm was activated in McNamara Dorm in Sylvan Residential Area on Eastman Lane. 3:02 p.m.: An accidental/defective alarm was sounded in Butterfield Dorm on Clark Hill Road. 3:06 p.m. An accidental/defective alarm was sounded in the Campus Center on Campus Center Way due to a dirty detector in the third floor elevator lobby. 3:05 p.m.: A fire alarm in the Life Sciences and Laboratories building on Thatcher Road was sounded due a duct detector. 3:10 p.m.: Amherst Fire Department was sent out to Butterfield Dorm on Clark Hill Road after the activation of a detector outside of a room near the stairwell. The alarm was reset and trouble will remain. 7:05 p.m.: A wastebasket fire in in Thoreau Dorm on Massachusetts Avenue was put out by the time officers arrived. The fire alarm was reset and all units were clear. 4:41 p.m.: The operator of a vehicle on University Drive was stopped in Lot 50 near Washington Tower. Another vehicle was pulled over on University Drive and the operator was issued a verbal warning for failure to stop. 10:25 p.m.: A wallet found on North Pleasant St. was returned to its owner.